Yay! Time for Halloween indies! and I've recently purchased several minis from their newest Fall/Halloween themed polishes. over 2 coats of Sinful Colors' 'Orange Creme'. 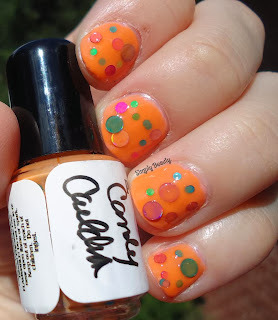 'Candy Cauldron' is a light orange crelly filled with small, medium, and large green, pink, yellow, blue, and dark pink circle glitters, some with a touch of holo. Application: You're gonna have to dig for this one to get most all of the glitters out. I actually really liked this, once it was all said and done. but the end result sure is nice!